Athletchics come in all sizes, even pint size. Athletchic Lacey Holsworth is my inspiration of the week. She is the reason for my new-found interest in March Madness. I’m not familiar with a single team, but now I find myself routing passionately for Michigan State. 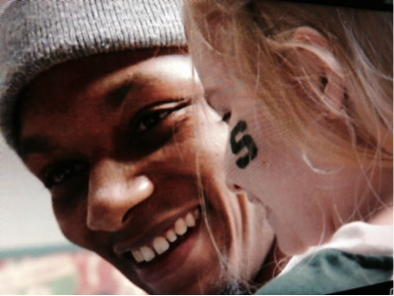 Can any of us get enough of that sweet little face glancing over adoringly at that macho Adreian Payne? The best part? His eyes mirror the same admiring gaze. Google Adreian Payne and you can’t fit all of his accomplishments on your screen. His basketball achievements are staggering, but his personal battles have perhaps molded him into the gracious young man he is today. He’s no stranger to adversity. Payne’s father was sent to prison when he was very young, and he lost his mother to an asthmatic attack when he was just 13 years old. She died in his arms. Then while at Michigan State, his grandmother, who raised him in the absence of his mother, also passed away. Enter cancer-battling Lacey Holsworth. (Is he her savior or is she his?) The eight-year-old fell in love with Payne’s smile the moment he and his teammates walked into her hospital room in St John’s, Michigan. The rest was history. Hundreds of basketball games and texts later, Lacey refers to him as ‘Superman’ and ‘Brother’. She is his wonder woman. Wonder woman may be the best description for this tiny package of inspiration. She is truly one of the toughest Athletchics I’ve ever seen. Battling neuroblastoma must take a lot of Lacey’s strength, but even after a prognosis that the cancer had returned last November, Lacey rallied to be at Adreian’s side during his team’s Senior Day and then again at Michigan’s Big Ten Conference Championship game. I’m sure no one present at the end of that Championship game will ever forget the sound of cameras clicking as Adreian carried Lacey up the ladder to cut the net. Wow, what a picture. I don’t know about you, but I’m now a Michigan State Basketball fan. Play on Payne and Holsworth. Play on.